How to roll a joint. These joint rolling tips teach how to roll a joint. How To Roll a Joint. Rolling a Joint Is Easy With Joint Rolling Tips. Learn how to roll a joint because rolling a joint is the original way to smoke marijuana. 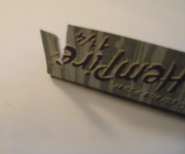 Before pipes, bongs, and weed vaporizers, was the Zig Zag joint rolling paper. the same purpose, good smoke! How to roll a joint with joint rolling tips and steps. 3. Alternative smoke or herb. 4. A poker/poking device, lighter, and confidence. 2. 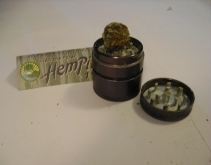 Grind bud into a fluffy flaky consistency or break it up with fingers. Do not turn the weed into powder, remember fluffy and flaky, and it only takes 3/10 or 0.3 of a gram to roll a joint. 1. Place your prepared herb in the wrap and pinch the ends of the paper together surrounding your herb. Slide the two ends up and down by using your thumbs and back pressure from your index fingers. As you roll it up and down feel for uneven areas of marijuana, seeds, and stems. Remove seeds, and readjust bud if necessary, consistency is key. 2. Once your buds are consistent and evenly grouped you should be ready to roll a joint. This is where your concentration is key so prepare yourself. Now roll the marijuana towards the non stick edge of the rolling paper. 3. This is the hard part, so try to keep your cool. Tuck the non stick edge under the opposite edge with your thumb, and pull the backside flap over with your index fingers. 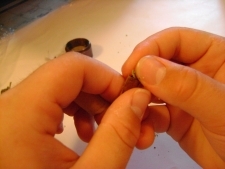 You must roll a joint fairly tight to minimize air pockets. Do this by keeping firm thumb pressure on the flap being tucked under, and pull the opposite flap over tightly with your index fingers. 4. Once you have tucked and pulled the opposite edge over, simply continue to roll the joint up with the goal of making it tight by keeping thumb and forefinger pressure. 5. When you are done rolling a joint lick the edge down, and air let it air dry. Once it is dry take your poker and press any loose buds back into the joint ends. Anytime you roll a joint you should use a crutch. A crutch acts somewhat like a filter for your joint but mainly they just prevent the end from closing. paper into a 1/4 in. 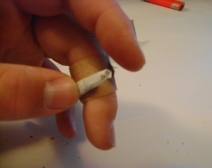 spacer that you stick into the smoking end of the joint.